NRA Gun Club: The National Rifle Association's official, non-violent video game. The NRA Has Its Own Video Game. It’s Called NRA Gun Club. National Rifle Association president Wayne LaPierre on Friday decried the violent video-game business as “a callous, corrupting, and corrupt shadow industry that sells, and sows, violence against its own people.” He should know. After all, the NRA has worked with that industry to produce a few firearm-filled titles of its own. 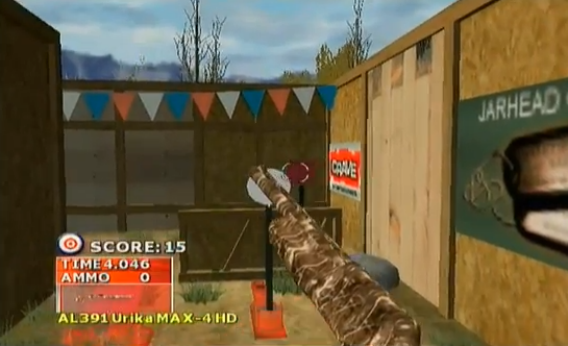 In 2006, it brought us NRA Gun Club for the PlayStation 2, billed as a “non-violent target shooter allows gamers to enter the shooting range, steady their nerves, and take aim at the bull’s-eye.” In contrast to the video games that LaPierre decried, no one in NRA Gun Club returns fire—the targets are all inanimate objects. This makes for a gaming experience that critics called “unbearable” and “abysmal,” and which a typical Amazon reviewer said “could very well be the single worst game in the history of games.” (Wonder if he ever played Kindergarten Killer?) But hey, at least it’s kid-friendly: Unlike the games LaPierre blasted on Friday, NRA Gun Club is rated for use by children as young as 10. In fairness, perhaps the game’s unplayability is a testament to the NRA’s commitment to its principles. After all, they couldn’t have paid too much money to Crave Entertainment to make this stinker. Which is good, because as Mother Jones points out, Crave titles like Trigger Man and Bad Boys: Miami Takedown are more the sort that the NRA’s LaPierre was talking about when he ripped the national media on Friday as “silent enablers, if not complicit co-conspirators” in the violent-entertainment industry. But, LaPierre added ruefully, “rather than face their own moral failings, the media demonize gun owners.” The NRA president, you see, cannot abide hypocrisy.